I can feel the pull of the GAS to go full metal jacket since I bought my Jim Dandy. I just love playing acoustic slide and blues. No, but I'm strangely drawn to it. I've kind of had a hankering for something like this. And a lap steel. And a uke... the list goes on, for a long time. Just other random acoustic instruments to give me something different to noodle on. I don't know what it is about this... do they make them in other colours? Hi. I am new to the forum so thought I would say a quick hello and chip in on this post. Yep I have played that exact Gretsch. I am in the UK in Devon and I played one a few months ago at a local shop. I was close to buying it as the guy in the shop worked me out a crazy price, but unfortunately my car decided to wreck havoc with my finances so for now I shall have to pass. These are superb instruments. I couldn't believe how much tone and feel it gave for such a modest price. I tried a few different versions as the shop had some other models in stock too. They were all lovely and while I was in the store I noticed that they were creating a buzz with other customers too. These are really lovely playing sounding and looking instruments. I tried out the boxcar model (I think) sometime ago and was well impressed by its tone. But when I tuned it to open E, the cone started vibrating. Probably just a one off but worth checking before you part with your cash. They seem pretty good value for money though! I'm nipping down to Brum this weekend as one of the shops has got them in stock..and also a couple of Recording King tri-cones. I think they've done a really good job on this line of resonators. Up until these came out the only decent sub-National resos around were the Michael Messer range. They're still great and if you'e looking for vontage National sound on a budget they're the ones to go for but these Gretsches are a great option too, and a bit individual. I think they've done a really good job on this line of resonators. Up until these came out the only decent sub-National resos around were the Michael Messer range. They're still great and if you'e looking for vintage National sound on a budget they're the ones to go for but these Gretsches are a great option too, and a bit individual. 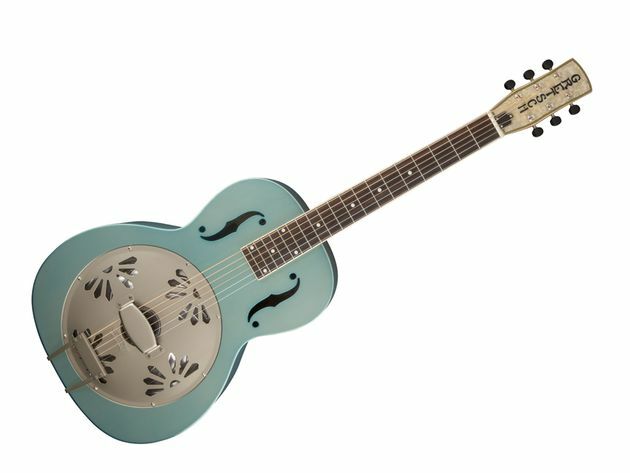 Thanks @Lewy, I agree about the Michael Messer resonators, I was looking at the 14th Fret MM Blues as an option so I contacted him last week to see if he has any for sale, but he is out of stock at the moment, his next delivery is in 12 weeks. Interestingly, a chap about 30 miles from where I am has just posted up for sale his thinline Michael Beard Goldtone Signature for about the same price as the Honey Dipper. I've no experience of thinline resonators...ie. how much does it effect the volume? But I may go and have a look at it as the Beard models are supposed to be rather good. I've no experience of thinline resos either - I would imagine there will be some impact on sound - on a reso, the body is basically a ported speaker cabinet. One thing to keep in mind is that, if I'm not mistaken, the Beard Gold Tones are spider bridge resos. The Honey Dipper pictured above is a biscuit bridge reso - two totally different sounds regardless of brand - so you won't be comparing apples with apples. Let me know what you think when you get your hands on some. see if you are as impressed with them as I was. I would be interested in your experience. Have fund trying them out and what you though compared to the Recording kings. Well I've darn gone and bought the beast. I nipped down to Fair Deal Music in Brum with the intentions of trying out a few resonators they had in stock. There were no Honey Dippers on display .which concerned me as they has told me they has stock of them. The sales chap was raving about how good they were..and said the display one had gone down to London for a trade show, but he had been playing it all week. He thought he might have one boxed in the 'back' so shot off to see if he could find it. In the meantime I has a close look at a Recording King tricone that was hanging on the wall, but unfortunately it had a crack in the neck-heel, which I reported to the staff on the counter. Anyway, back come the sales chap with a spanking, fresh in the foam, blue Honey Dipper. A quick unpack and tune up...and she was ready to try. It I were to sum up the guitar in one word it would be 'sonorous' . The sound was just stunning, way better than any other metal resonators that I have tried in the past. In this price range the only competition is going to be a Michael Messor resonator... if you can find one. Being in the 'budget' range of resonators, I was struck by the sheer quality of it's construction. The neck is a single piece of wood, including the heel, and the set up out of the box was perfect for both slide and normal playing. The finish was faultless. Gretsch are really keeping a tight rein on their QC for the instruments they are having built in China, which this one is. There is plenty of volume, and the thing sustains for ever. For me it was a no brainer, this little, but weighty bell-brass guitar sold itself to me and I am delighted with it. Thanks to Fair Deal Music who gave me a fair deal on my purchase. I forget the young saleman's name, but he was really helpful..and a superb acoustic player to boot. I've been really enjoying getting to grips with guitar. I did find that the strings it came with were too light and I ended up buying some Nickel 13-56 Micheal Messer strings. and that has made a huge difference. I think though that I may increase the top E to a 14 and the bottom E to a 58 to help with the clarity when playing slide. What I really love about the guitar is the built in reverb effect from the bell-brass.. I hadn't thought about the cold aspect of it. Good point and I guess you don't think about that until you have had one for a while. Enjoy.I am sure you will.